San Jose a Divided City, or Did Dave Cortese Just Blow It? Between Dom and Dave, a Cortese has represented parts of eastern San Jose going back to 1969. Supporters of Dave Cortese’s unsuccessful bid to become mayor of San Jose continue to insist that San Jose is a city divided. 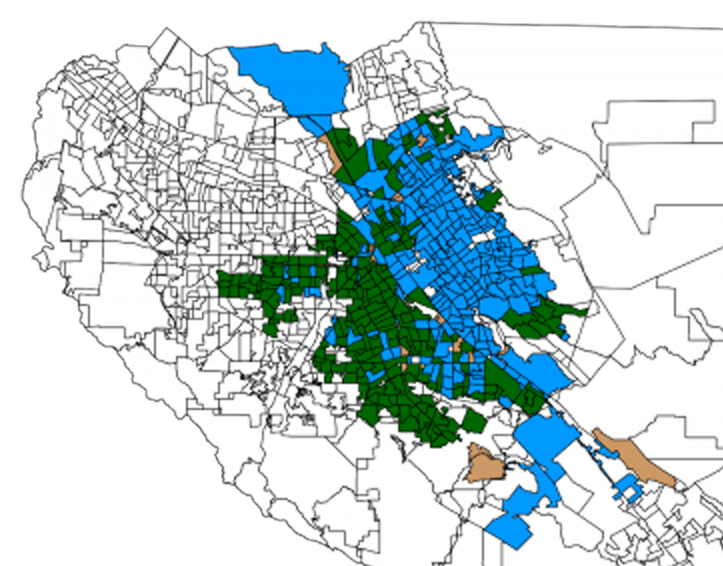 In particular, a color-coded map of precincts has been cited as showing a demarcation that cuts straight through the middle of the city, separating affluent white voters who supported Sam Liccardo in the west from more diverse, lower-income voters who backed Cortese in the east. But there is an underlying detail in the election analysis that has received almost no attention: incumbency. Looking at vote totals alone, one could reason the "city divided" mantra is real, with Sam Liccardo edging out Cortese with just 50.8 percent of the vote. This reinforces the mindset of voters who were primarily motivated to support Cortese by the divisive issue of pension reform. But past elections show that close mayoral races are more often the standard in San Jose than the outlier. Chuck Reed trounced Cindy Chavez in 2006, when he took almost 60 percent of the vote. Yet in the previous mayor's race featuring non-incumbent candidates, 1998, Ron Gonzales edged Pat Dando with just 51.17 percent of the vote. In 1994, Susan Hammer defeated Frank Fiscalini with a lesser margin than Liccardo's victory—just 50.38 percent of the vote. Going beyond low-voter turnout this past election, which hurt Cortese more than Liccardo, the reality is that Cortese had a built-in advantage that was squandered by being an uninspiring candidate. A Cortese has represented voters in the eastern areas of San Jose since 1969. To put that in perspective, that's the first year Richard Nixon took office as president. It's the same year the first man in history walked on the moon—unless you don't believe in that kind of thing. Dave’s father, Dom, served on the county Board of Supervisors for an 11-year period ending in 1980. After that he served more or less the same area of San Jose for 16 years in the state Assembly, before joining Alum Rock’s school board for an additional four years starting in 1998. Dave followed in his father’s footsteps, using the traditional starting point for a political career by joining a school board. He ran for and won a seat on the East Side Union High School District in 1992, before moving up to the San Jose City Council in 2000. Eight years in that office, followed by the past six as a county supervisor like his father, and the Corteses have a legacy that accounts for a combined 53 years of representation. That’s the kind of name recognition money can’t buy—at least not in a single campaign. The first polling showed as much. But name recognition wasn't enough to overcome some significant strategic flaws, namely that Cortese failed to lay out a vision for San Jose beyond increasing police officer pay and benefits. The San Jose police union also overplayed its hand, so that both candidates were on record—ad nauseam—saying that they wanted to beef up the department but had different stances on Measure B, which passed in 2012. As one of several elected officials admitted to me on Election Night, when returns showed Cortese trailing, "Most voters don't know what the [cluck] Measure B is." The race's focus in the final weeks was a war of words about who told police officers to leave for greener pastures, and Cortese couldn't control the message—which in the end meant his campaign didn't really have one. It's unlikely Liccardo will restore relationships with city unions, especially the police, any time soon. But repeating the mantra that the city is divided is really just a face-saving measure for the camp that fell short. It's designed to create future leverage at the negotiating table. And it's a tactic most voters don't give a [cluck] about. Candidates Line up for District 4; Interim Appointment Coming? I don’t think SJ is divided, the fact is less than 200,00 out of a million even bothered to vote. Sam will not renew relations with city unions, so let us just live with it and watch our costs and crime grow. Lets move on as will many of our public safety. Retired wrote: “the fact is less than 200,00 out of a million even bothered to vote.” Yes, retired, the turnout was low; but a million voters in a city of a little under a million? So, do you think every resident of SJ can vote? Yet another reason I’m glad you retired. So I am , please keep sending my check on the first of the month, after 30 years I welcome it! And no, there are many who cannot vote because they are illegal, kids or felons or never bothered to register but must importantly, the legal voters don’t care to study the issues and bother to vote. This is not just a city but county, state and national problem. You are wrong Retired and no, I will not get off your lawn! The same people who think that there are one million voters in San Jose are the same people who dont study the issues…you seem like someone who reaped a lot from the City of San Jose only to leave and begin shaking your fst at people who are the men and women in the arena (City of SJ not the Shark Tank)…relax on your cot in your den while watching Golden Girls reruns (HILARIOUS show) and dont judge the new Council and Mayor until they have had a chance to perform their duties. Ya all you people judging Sam by who he has shown himself to be in the past need to chill out and put it behind you. Have a long sip of Kool-aid and give Sam a chance to prove he really does value city employees. Give him a chance to implement his plan to increase SJPD staffing by redirecting money from less important City services and scrapping Measure B, approving the first raise since 2008 and ensuring officers hurt on the job will not be left without a job… we all know Sam said and did things as a Councilman that he must completely divorce himself from in order to reinvent himself as a Mayor who gets it! Oh my… if these things were to come to pass that would mean that Sam has no principles, no value, honor, integrity…. is that the Sam the slim majority voted for? Seems it is. I don’t have a lawn, went with water efficient plants. Don’t have a den either and don’t want a cir but may get a recliner. I forgot to mention (Golden Girls, really are you in your rocker?) And if you find my non lawn jump all over it. Under Sam nothing will change, have a great life, I did while serving SJ. 2014 was about as good a year for Republicans as its possible to have, and Liccardo was perceived as the less liberal of the two candidates. If the election had been held in 2012, 2008, or 2006, Dave would have won. For that matter, if Mitt Romney had won the last Presidential election, Dave would have won. But the voter turn-out patterns in 2014 favored Liccardo in 2014, in a close race. I agree with the analysis of the great Rush Limbaugh: 2014 was NOT a vote for “Republicans”, it was a vote to STOP OBAMA. If the SJ mayoral race was swung to Liccardo by Republicans, it was an accident. The election was, in terms of personalities, dead even. There was not much to choose between Liccardo and Cortese, EXCEPT . . . EXCEPT for Cortese’s choice of associations. The Central Labor Council, the SJPOA, and their scary, mouth-foaming, glassy eyed, insolent, “take-no-prisoners” supporters turned the election . . . FOR Liccardo. Cortese tried to sloganeer his way into the Mayor’s office, and it’s a blessing that it didn’t work for him. Fascinating to see all of the “progressives” who supported Cortese coming out of the woodwork this past month to praise the Council’s decision to levy a housing impact fee on developers, a plan that Dave openly opposed throughout the entire campaign. Working people need a champion in the Mayor’s office, and Sam is that champion. It was sickening to see so many people and organizations who claim to support working people support a candidate who would throw affordable housing under the bus only because he had promised favors to narrow constituencies of police and firefighters. ???? Liccardo , A Champion for the working people” ? yeah , If this was SARATOGA. A million people in SJ includes children who can’t vote, let’s not exaggerate too much here. Children, H1b visa’s, felons, and as of late, a ton of EB-5’s using the housing boom as an investment. > separating affluent white voters who supported Sam Liccardo in the west from more diverse, lower-income voters who backed Cortese in the east. “white voters” can be and are “diverse.” To suggest that they are NOT diverse is an ignorant stereotype. Mr. SJOUTSIDE, I thought you prided yourself on your precise use of terminology. In common parlance, “diverse” means “of different races or ethnicities.” In that sense, white voters are not and cannot be “diverse.” They may not all vote alike, which may be what you mean, but then again, if this election were analyzed by race, the majority of white votes (meaning over 50% of white votes) probably did go to Liccardo. I don’t care about that one way or another, but “diverse” — meaning “of different races” — is what Josh appears to have meant. So, saying “white voters” are not “diverse” is not an “ignorant stereotype;” it is plain and obvious as a matter of definition. “Racial Diversity” means racial diversity. Ditto for ethnic, religious, partisanship, gender, orientation, and so on. That the diverse white American peoples are diverse may be found in home country native languages, economic principles, governance principles. Diversity among peoples means more than just racial diversity. Great argument, that an .8 difference doesn’t (?!?) mean the City is divided. Someone needs remedial math lessons, or to interview crime victims from the East side instead of Slick Sam/Rufas Reed (who have everything to gain from cooking the numbers). San Jose is not divided, its voters are tired and confused. Hence the low turnout and the lack of a mandate for the winner. The geographical divide in the voting are probably more due to the impact that the lack of police staffing has had on the two sides of the City. There is little point in trying to create some kind of ethnic divide in the voting results. Both candidates are at least part Italian Americans with similar upbringings. The take away from this election should be the reduction in perceived support for the Measure B strategy from 70% down to just over 50%. And even this 50% can hardly be taken as support for Measure B itself. Mayor-elect Liccardo has already taken positions that are antithetical to the charter amendment that was enacted by Measure B. The plain words of the charter now contain mandatory provision to reduce pay on all City Tier 1 pension members. The economic reality however has led the Council, Liccardo included, to vote to restore pay to the Police and other city employees, to a lesser degree. At the same time, the Mayor-elect takes the position that the City should continue with its litigation to implement Measure B to be able to increase employee pension contributions to effectively reduce Police and other city employees’ pay. This is sheer “Voodoo Economics.” It is about time that the Mayor-elect and the incoming Council come clean with the voters and admit that Measure B was a terrible mistake that did not at all achieve what was promised. Have the voters been tired and confused for the last 3 election cycles ?? It’s pretty tiring and confusing for voters to have the Mayor consistently lie to them about the legal and fiscal soundness of a purported pension “reform” plan. I think you are right. This has been going on for the last 3 election cycles. The last election was affected by a wealth of divisions: those who voted and those who didn’t; those motivated by the issues and those by civic duty; those who vote for their own kind and those who choose objectively; those who allowed their emotions to influence them and those who kept them at bay; those swayed by the glossy overload of campaign mailers (I received six Sam’s for every one Dave) and those not; those with reason to be fearful about police shortages and those without; those who believed the Mercury News covered the race objectively and those who believed or knew it hadn’t. Sam Liccardo won the election; the margin by which he did tells us much more about the control of information than it does about the registered voters who did or did not cast their ballots. The Mercury News threw its all into the campaign, desperate to prove itself (to advertisers and politicians) as a relevant force in local events. Its persuasive power came in three forms: the ability to disperse its message (with hard news, fluff pieces, and editorials), the ability to suppress opposing messages, and the risk-free ability to employ character assassination (a tripartite that mirrors how information was controlled in the Soviet Union). As the only major newspaper in town its writers and editors had little concern about the accuracy (or deliberate inaccuracy) of their output, which allowed them a level of deception and recklessness not even possible on campaign signs or flyers (which are subject to oversight). Dave Cortese did not win the election, but it was the residents of this city who really lost. The city’s big problems, many the result of actions taken by our elected leaders, cannot be solved using any of the much-touted and absolutely bogus solutions offered by Sam Liccardo. The police department is in a meltdown, the employees are at risk and fleeing, and the much-criticized “hand” that some say was overplayed by the POA during this election was not a poker hand, it was a hand desperately waving for rescue. It was a hand ignored. Expect the flight to continue. So now I am waving my hand, inviting everyone who’s demonized the cops, the POA, or Jim Unland to come on down and justify their charges, and/or reveal exactly how any of Sam Liccardo’s stated solutions will solve anything. I’m eager to learn from the winners. Sure, San Jose is divided. By council districts. It’s no surprise that Sam won in precincts run by his council allies, and Dave won in districts run by his council allies. You overanalyzed this too much Josh. Agreed and Dave didnt blow any advantage…he lost by 19 percentage points less than Cindy did. This article is useless. All this Monday morning Quarter Backing is a bunch of Crap. These tactics by the greasy publications, were as nasty and vile as the previous elections, yes, that includes the stamp lickers. Liccardo, helping a homeless man push his cart out of that homeless incampment, in the Murky Nus. PLLLEASE!!!!! Not more than a mile from there is the San Jose Giants. Where the hell is Liccardo in supporting our own home baseball team. Where the hell is Stone, Gonzales. What happened to AMERICANA is San Jose? You choose the word to describe where these guys really live. I grew up fielding foul balls at the then Bee’S Stadium. We all went into the Armed services, and many of us never returned. However those of us that did, will never forget what our Home base ball team meant to Us. My take on that photo of Liccardo was that he was actually evicting that man and his cart by force. Since “perception is reality” that’s how I have captioned it. I’d bet that he had an aid close by to give him the bottle of Germ-X as soon as the camera was out of range. I do have to hand it to reed, as phoney as he was, you would never find him out there making that much of an arse of himself. There is phoney and then there is REALLY phoney. And if you had a puddle on your yard, the EPA would have classified it as a “wet land” and probably slapped you with a hefty fine. “Better be careful with a brown lawn retired. I had code enforcement called on me for it, and had to pay a hefty fine. Was told “The yard is unkept and looks like blight”. Wow I cannot believe you paid a fine, ignore and the city would never follow up. I now have a drought free yard sorry you had to pay a fine, Really SJ still has a code enforcement unit? Kind of like the riding a bike on a sidewalk law. This has been a muni code law for years and will never be enforced but the city council made it sound like it was a new idea. That is because Sam had all the downtown lanes changed. I don’t see any enforcement when trucks park in the bike lanes. Thankfully some of us started a new thread. Hate the threading system. Josh does this stylesheet have a fixed width in the body section or something? Nah retired, just pay it and move on. I had a period when I was around 18 where I thought I could just not pay, and it would go away. Unfortunately I’ve never been a victim of the type of “affluence” that others might enjoy, and have had to pay for my mistakes just like everyone else. Learning that lesson at 18 has kept me out of trouble most of my adult life. TLDR; Not paying fines = courts. Courts = no fun.